Pick up a local 4G sim card upon landing in the Dubai International Airport. Choose from 3 packages and pick up the option, which is suitable for you; Starter Pack (250 MB + 25 Minutes), Ultra Pack (1.5 GB + 30 Minutes), and Mega Pack (3 GB + 50 Minutes). Now, you can browse faster without issues of service throttling, make hassle-free international calls, recharge from anywhere and anytime, and avail services from customer care. The sim card is available in nano, micro, regular sizes to fit your requirements. Validity: 7 days from the day of pick-up. Validity: 15 days from the day of pick-up. 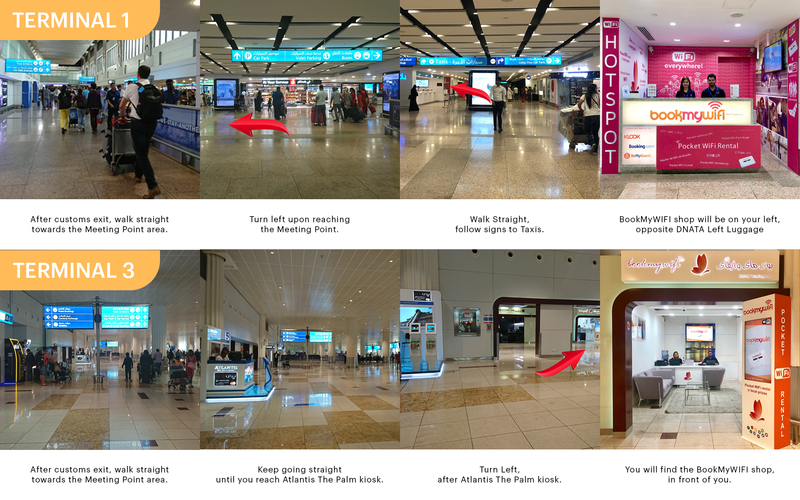 The product is available at Bookmywifi shops in two terminals of the Dubai International Airport; 1 and 3. Walk along the exit path until you reach the greeters’ area. After that take a left and walk towards the taxi pick up area, you will find the collection point to your left. Make your way to the Atlantis Hotel Kiosk and from there take a left, you will find the collection point. Your voucher is only valid for the specified date. Please make sure to collect it on that particular date, as there won't be any refund if you fail to do so. You must carry your passport and display it at the collection point when you visit it to pick up the kit.